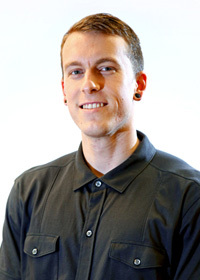 The combination of majors Cole Holcomb studied as an undergraduate at the University of California, Santa Cruz, may seem unusual to the typical observer. But to him, taking philosophy and physics together was natural. “My interest in both subjects is coming from the same place – an attempt to understand the world around me as best I can,” says Holcomb, a Department of Energy National Nuclear Security Administration Stewardship Science Graduate Fellowship (DOE NNSA SSGF) recipient. “Physics offers one very good pathway for that, but there are other questions that physics can’t answer” relating to epistemology, ethics and morality. The quest for fundamental understanding led Holcomb to study supernovae and now, at Princeton University, cosmic rays – subatomic charged particles flying through intergalactic space. They’re an engrossing plasma physics problem, he says, but “I’m less interested in the specific topic and more interested in the generalities that plasma physics research entails. I like the tool box you use” to tackle problems and the work’s mathematical nature. Holcomb’s research with professors James Stone and Anatoly Spitkovsky aims to sort out this effect. Holcomb computationally models a magnetic field running through the interstellar background plasma, then injects it with simulated cosmic rays to see what happens. To capture these highly nonlinear interactions, Holcomb uses the particle-in-cell (PIC) method, which tracks representative cosmic rays as they move through the interstellar medium. Such calculations became possible only with the advent of high-performance computer systems capable of trillions or quadrillions of calculations per second. This power lets researchers solve the complex physics equations with few if any simplifying approximations. The question facing astrophysicists is whether there’s an intermediate scenario – a “Goldilocks” sweet spot where wave amplitudes are neither too high nor too low – in which the cosmic rays efficiently drive galactic winds. For that to happen, “there needs to be something that takes energy out of the magnetic field as fast as the cosmic rays are putting energy in,” Holcomb says. Energy in and energy out must balance or the magnetic field will grow or shrink. It’s a knotty computational problem, but Holcomb’s PIC simulations seem to find the damping effect. Now his task is to learn how much it applies to the real world of astrophysical phenomena. That will require more detailed – and more computationally demanding – simulations. Holcomb has worked with Spitkovsky to simulate this microphysical cosmic ray behavior. He plans to plug what he learns about this small-scale action into Athena++, a large-scale astrophysics code Stone has developed. Like most magnetohydrodynamics codes, it treats the cosmic rays and plasma as fluids. That approach demands less computational power than the PIC method but also relies on fine-tuned input parameters like those Holcomb is developing. The team’s research can provide clues to mysteries surrounding galaxy and star formation, while also advancing understanding of stewardship science issues, Holcomb says. “If you remove the specifics of the story I’ve told you, it’s more generally what happens when you have high-energy particles streaming along a magnetic field in a plasma,” he says. That includes conditions in fusion energy reactors like the tokamaks at DOE’s Princeton Plasma Physics Laboratory. Image caption: A false-color image of starburst galaxy M82 and its outflow using combined data of the WIYN and Hubble space telescopes. Purple represents light emitted by ionized hydrogen, illuminating the bipolar wind from the galactic disk. Research into cosmic rays seeks to help explain how such structures form. Credit: Mark Westmoquette (University College London), Jay Gallagher (University of Wisconsin-Madison), Linda Smith (University College London), WIYN//NSF, NASA/ESA.